13.1 miles. Whew….glad that’s over. 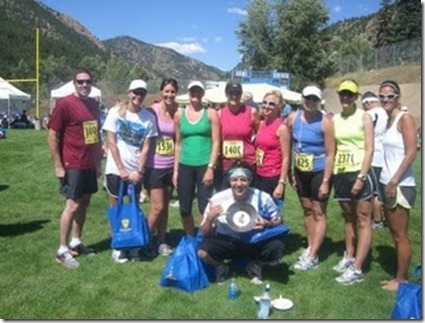 The Georgetown 1/2 marathon was a BEAUTIFUL race up in the Colorado mountains. The temperature was perfect, the sky was blue. It was the perfect day for running. I got to race with lots of my girlfriends from the Ragnar, including my lovely sister, Nat. She drove home from Utah with me to do the race and visit for a few days. Susan hosted an awesome Carb Loading dinner the night before, that was the perfect pre-race meal. We all had to get up EARLY in order to make the drive up to the mountains. When we got there the line for the 10 measly port-a-potties (with over 3000 runners) was enormous. We were all still in line when the gun went off. Luckily, it was a timing chip race, so your time didn’t start until you crossed the start line. Everyone started the race at once, and so the first few miles were chaos! Adrenaline pumping, Nat and I weaved in and out of 100s of people, trying to find our pace. It sure does make the time go by more quickly when you are trying not to get stepped on. The course had lots of rolling hills, but we lost about 1000 feet of elevation by the finish line. I lost Nat at the mile 4 water station—I didn’t know she was stopping until I was already up ahead of her. I recently got new running shoes (Brooks Ravenna) and I love them! This day was no exception—everything felt really good. Until mile 10. That’s when things always start to go downhill for me. Aching legs, hungry stomach, tired mind. But I figured that if I kept up my pace then the whole thing would be over quicker. No use prolonging the pain by slowing down. I just put my legs on autopilot and focused on my music. Luckily I had been doing some of my training with Jen, who always runs faster at the end of her runs than the beginning. This really helped with my stamina. The end of the course wasn’t well marked, and it seemed like the last mile took FOREVER. But I crossed the finish line strong, and with a new PR—1:48:49. Race day makes all those long, hard training days worth it. I get a runner’s high for about a week! Great job Tara! I need to learn how to go on autopilot and not give in to the pain. Sounds like everyone did great. AWESOME! Way to go Tara! Thats a great PR! Looks so fun! Also…. sky diving?! I'm so jealous. Sorry, that last one was from me, not Josh!